The Traffic Commissioner has revoked vehicle licences for Baldwins Crane Hire and disqualified four of its directors after drivers were caught falsifying records. An investigation into the company found drivers faking rest breaks in order to ensure cranes would be on site ready to work on time. Traffic Commissioner Kevin Rooney said: “The falsification of records to make it appear that drivers had taken appropriate rest goes absolutely to the heart of road safety. “In the case of this operator, five out of seven drivers investigated in 2014 were found to be so offending. 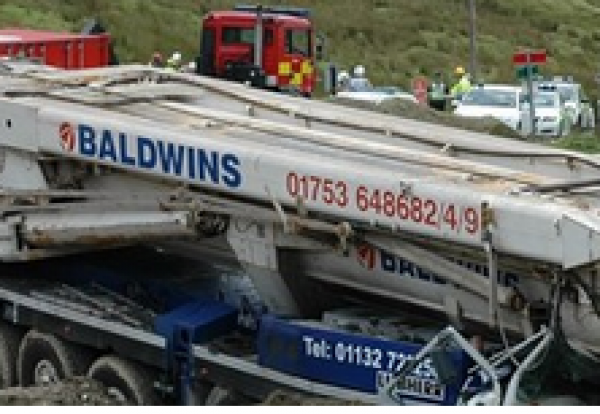 In December 2015 Baldwins Crane Hire was found guilty of corporate manslaughter and fined £700,000 following the death of a driver in a crash in East Lancashire. Rooney added:”I do not know if my decision will mean the end of Baldwins Crane Hire limited, but I make my judgement on proportionality on the assumption that it will. The revocation of the company’s two licences will take effect from September 10. The orders for disqualification of Richard Baldwin, Wayne Baldwin, Andrew Skelton and Lorraine Baldwin will take effect on the same date.